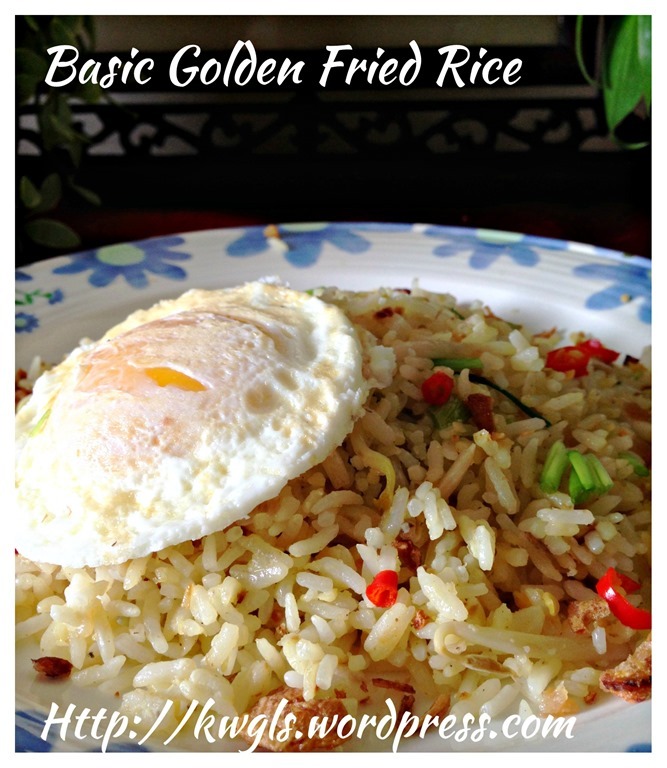 Every time when I posted my fried rice, members of Facebook Groups and friends will ask why my rice is grainy and evenly coated with eggs and that reminded them of the famous Chenfuji fried rice in Singapore. 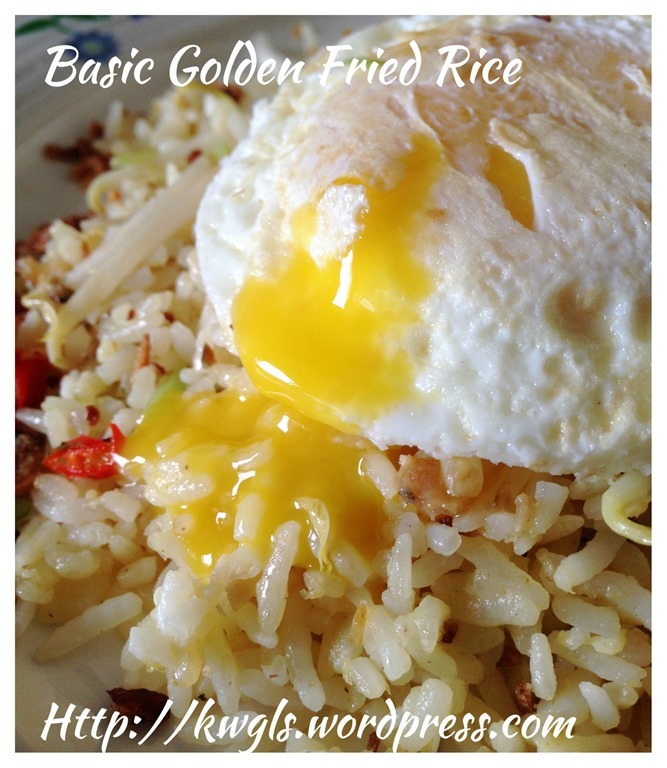 This Singapore restaurant is famous for its crab meat egg coated fried rice and that prompted me wanted to share my fried rice techniques with readers. 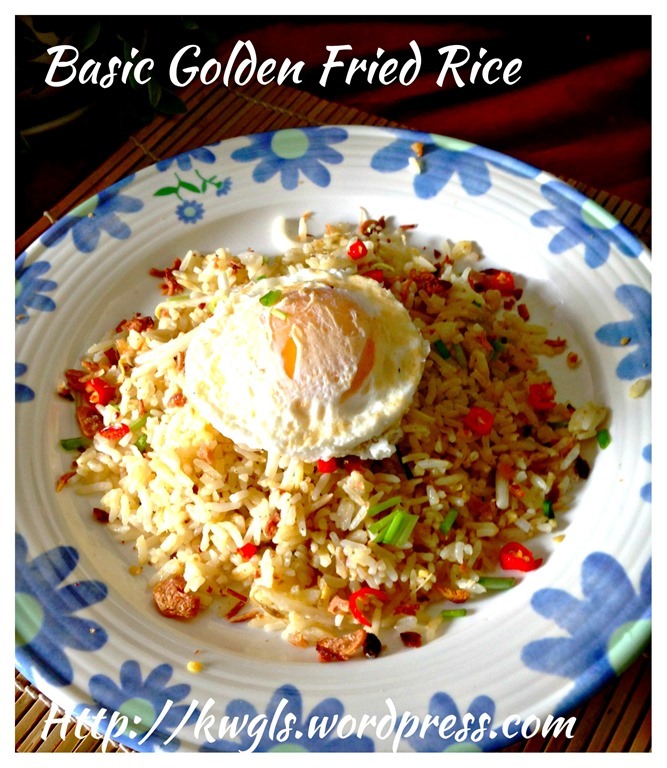 Fried rice is not difficult at all but there are some simple pointers of stir frying rice and I hoped that via these simple pointers, readers can come out with his or her favourable version of fried rice. 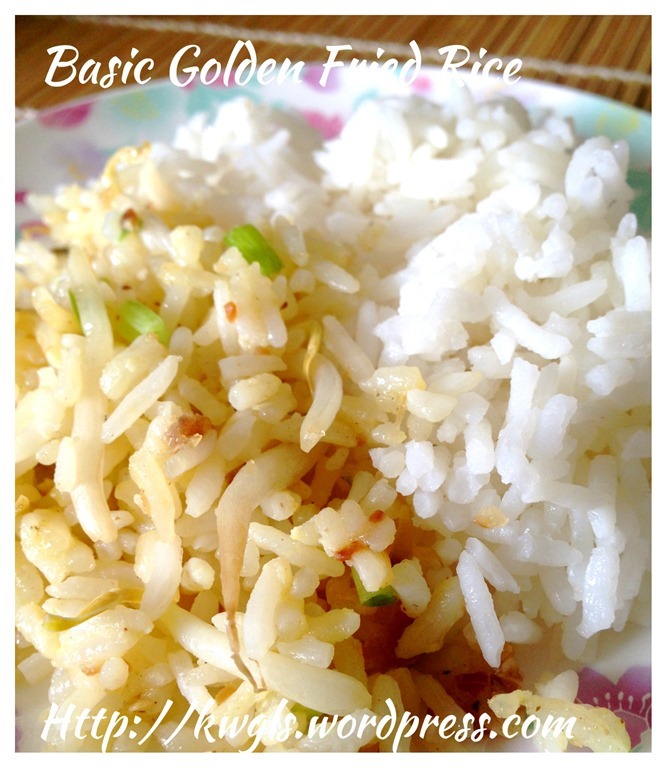 The pictures below depicts the difference between golden fried rice and white rice. 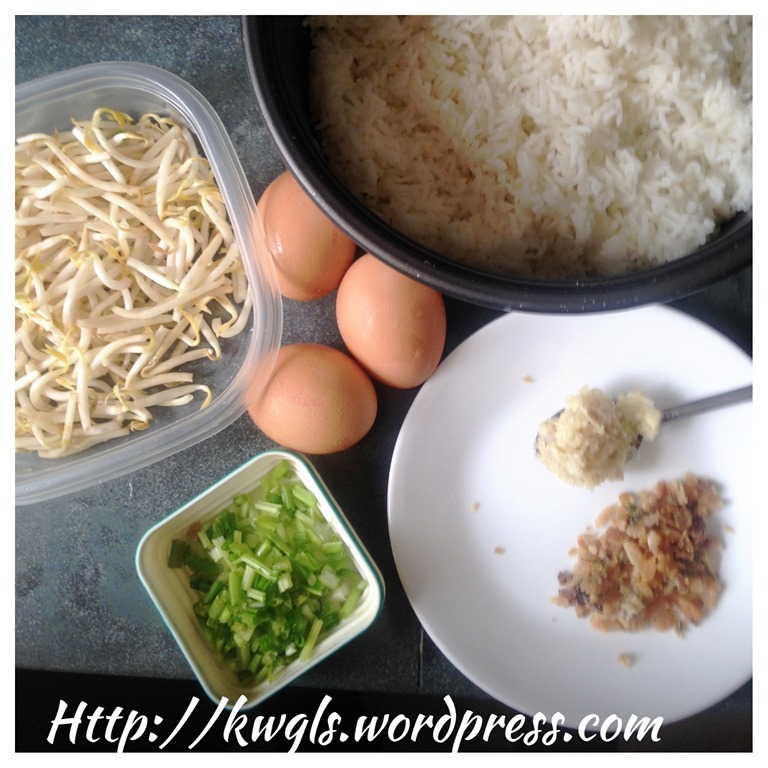 For this illustration, in order to illustrate the effect of egg coated fried rice, I have selected simple ingredients using salted fish, bean sprouts and eggs as the main ingredients. Of course you can choose any ingredients that you liked.. Crack the eggs to the cooled rice. Add salt, dashes of pepper and other seasonings. 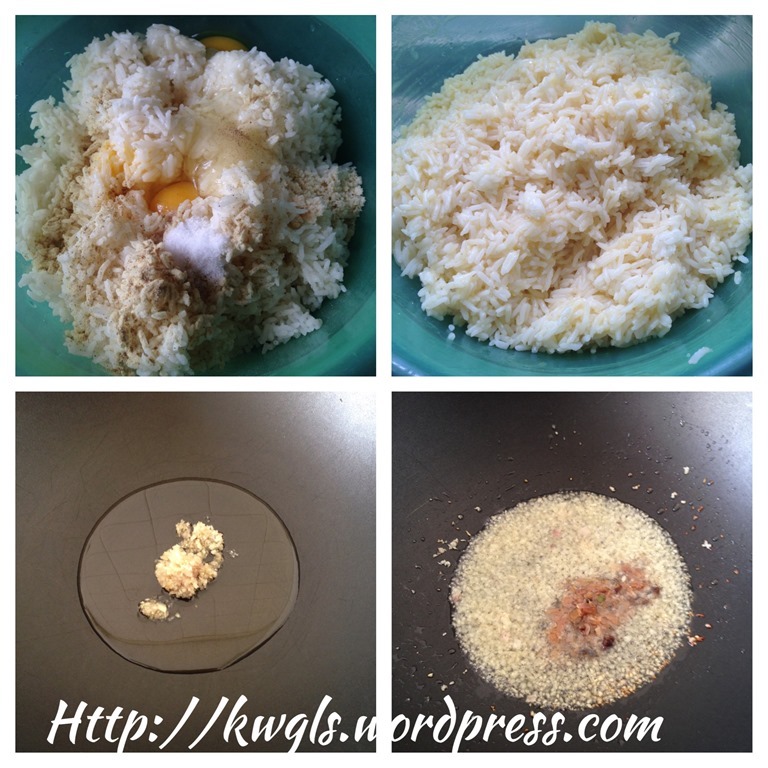 Use hand to stir the rice until the rice are coated with raw eggs as evenly as possible. In a big frying pan, add the oil, sauté the garlic until fragrant and golden brown, add in the salted fish and stir fry for an additional one minute. Add in the rice, stir fry until the eggs dries up. If desired, add more seasonings. 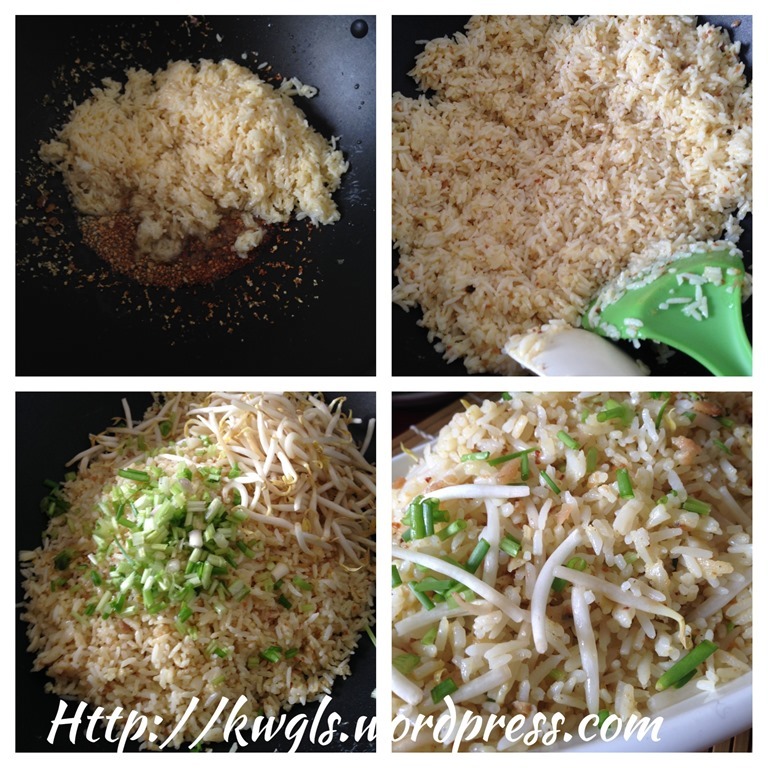 Add in the chopped spring onion and bean sprouts, stir fry for another 2-3 minutes and dish up. Best to serve warm . 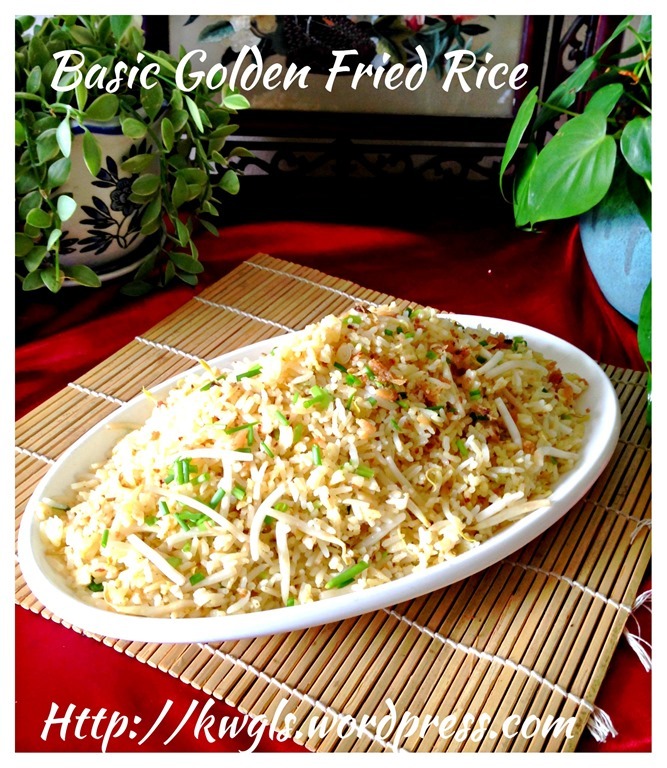 Usually for one cup of rice, one egg and one tablespoon of oil is used. 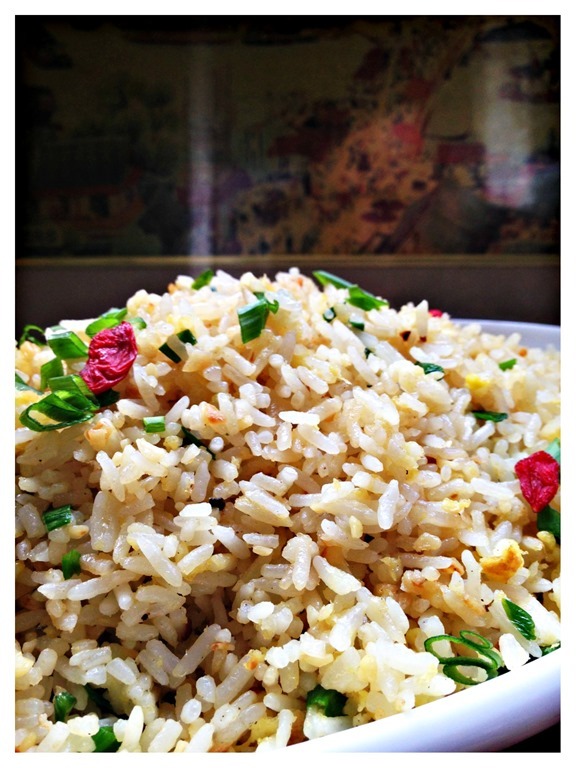 Overnight rice is ideal but freshly cooked rice is acceptable. However, the rice have to be cooled completely. If your rice grains requires say 1 cup of water for 1 cup of rice, reduce the water by 10 per cent to 0.9 cup of water for one cup of rice. This is to avoid the rice from becoming too soggy for stir frying. Throughout the whole process of stir frying, high heat shall be used. 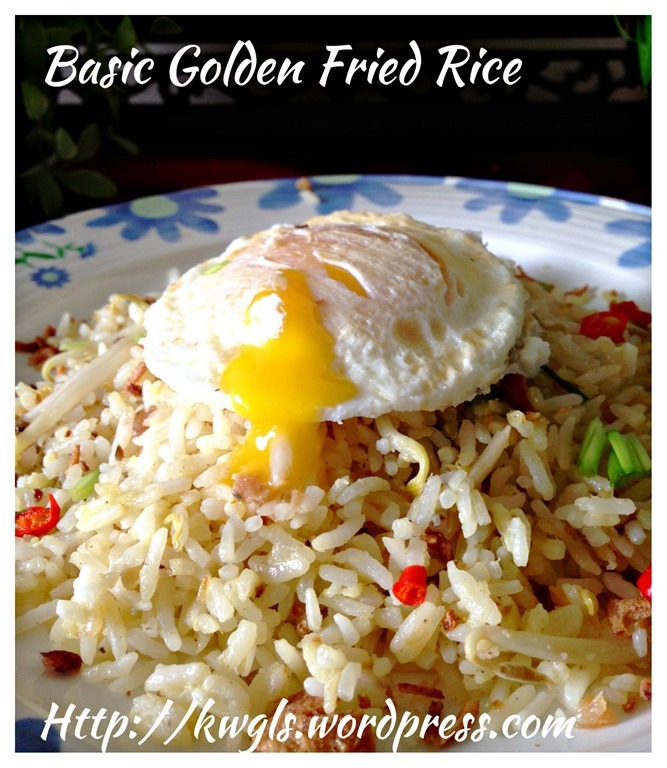 Some members of Facebook Group have tried this method of frying rice and are very pleased with the results. I hope these pointers will help new house chefs. 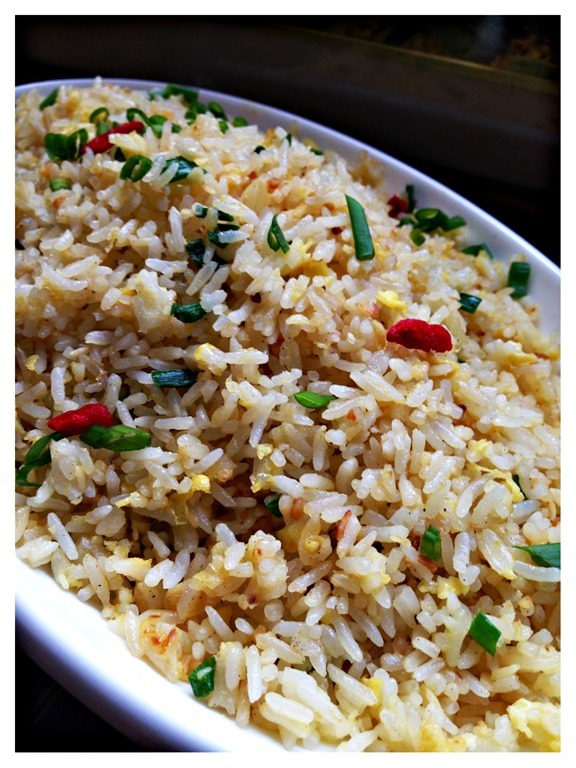 Feel free to add in anything that you like such as sausages, barbecue pork, prawns and etc.. Of course, with crab meat, it will transform the common fried rice into a very presentable dish.. 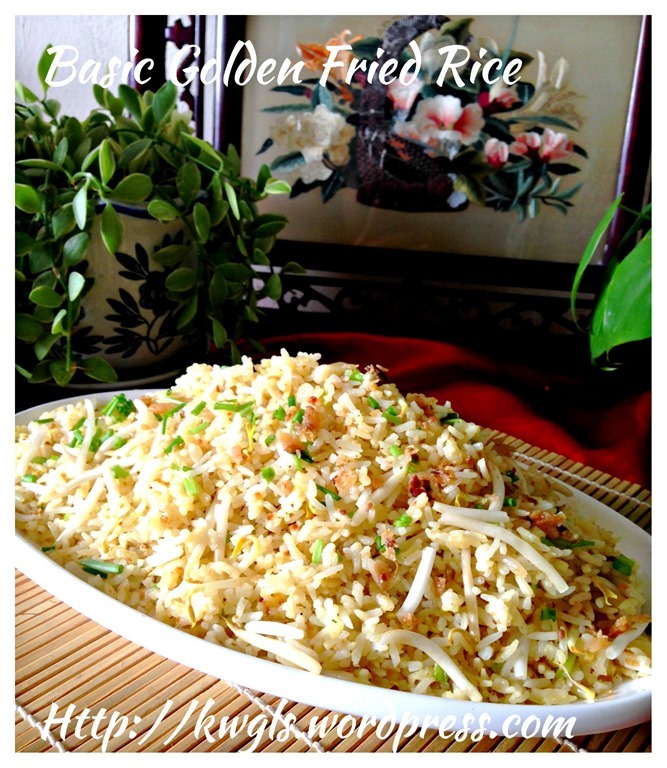 This entry was posted in Food Preparation Series, Noodles, Rice and Others and tagged 8, Golden Fried Rice, GUAI SHU SHU, Guaishushu, kenneth goh, postaday, salted fish fried rice. Bookmark the permalink. Hi, I’ve tried your method to hand stir the eggs with the rice and it looks well mixed. But the moment i pour the rice to the wok the eggs get cooked and separates from the rice. Too high heat? Not enuff eggs? Or is it because I beat both egg white and egg yolk to mix with the rice? The rice is not coated with the eggs it’s separates. What have I missed out here? Rice is cooked in the morning and I put fridge and take out in the evening to cook. Is my rice too cold for the eggs or i have to let the eggs marinate the rice for half hour? Or i should only use egg yolk, no whites? By the way, I mixed 4 eggs with 2 cups of cooked rice. I was surprised to hear this . Do you have any oil in the rice? It should not happen at all unless your rice is very oily… puzzling.. Sorry it did not work for you. As you know, egg coat with anything that is dry..
Ahaa, mystery solved. 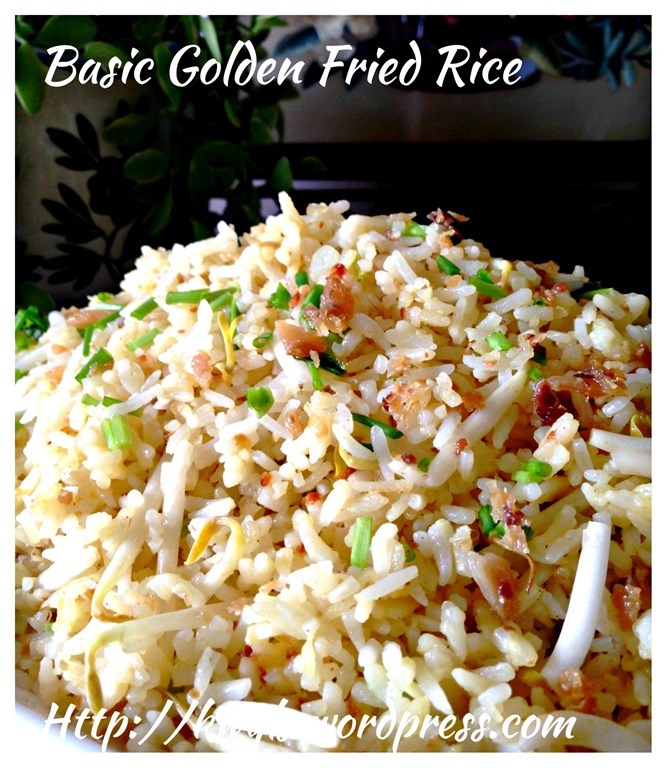 To add fragrance to the rice, i always fried with two cubes SCS unsalted butter. So it seems it’s the butter that i add to the wok before i pour in the rice. So I shall just use normal oil instead of the butter then? 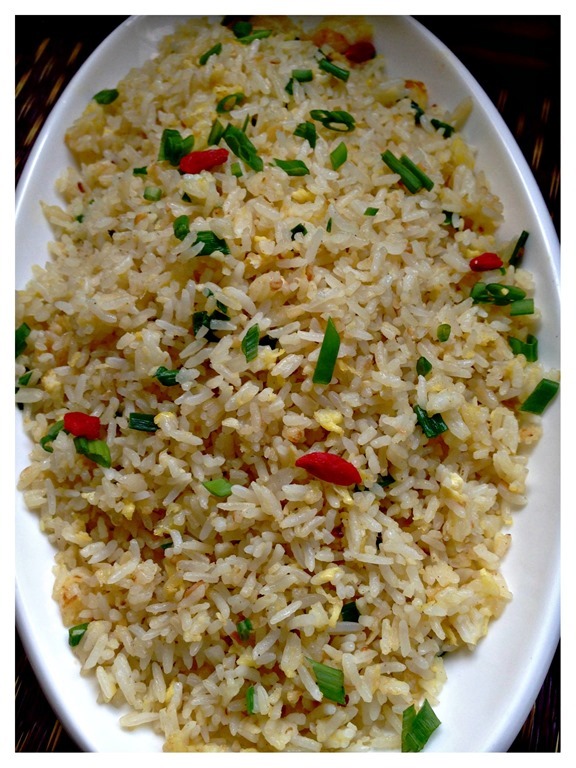 chen fu ji fried rice was famous for first few years, the standard of fried rice dropped tremendously, bo standard at all with that high price. Those who totally dont know how to cook also can cook better. Haha, thanks for your sharing. Have not frequented them for so many years..